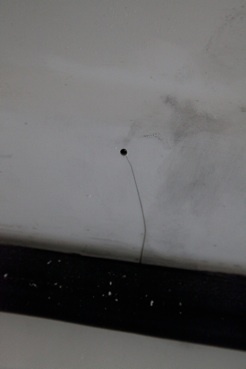 This crack, show above, was about 3/4 as wide as the top. 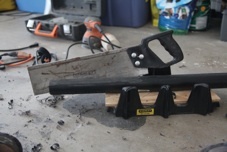 Using a few simple, inexpensive tools you can repair it by welding it. The crack has been fixed. It is not perfect, but it certainly cost less than $4500. 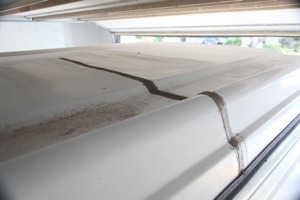 So, you have a VW Eurovan and it’s top has cracks. My girlfriend did too, so I did what any man would do.... Boast about my skills with tools. Let’s face it guys, going out and hunting for coffee in the morning is just not the same hunting for monkeys with a blow-gun and curare darts! I started doing some research and found that the top is made from two types of weldable thermoplastics. the inside head liner is ABS ( Acrylonitrile-Butadiene- Stryene) and the outer shell is ASA (Acrylonitrile-Stryene-Acrylate). There is much mis-information on the web. 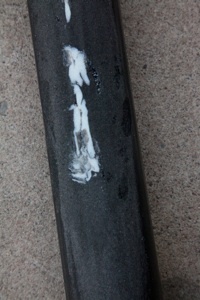 It is not PVC, but ASA, and this was confirmed by Winnebago, who makes the tops. 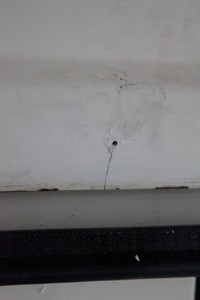 As a new top is about $4500, We decided to try repairing it by welding, which turns out to be possible. Using some inexpensive tools, a little patience, a willingness to fail and a willingness to learn from your mistakes will pay off. Start by removing any junk that was a previous attempt to seal it. 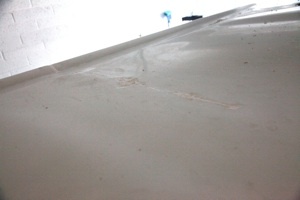 Epoxy or polyester resins won’t stick. The worst possible scenario is to have some silicone sealer. A little elbow grease and Isopropy alcohol will work pretty well. 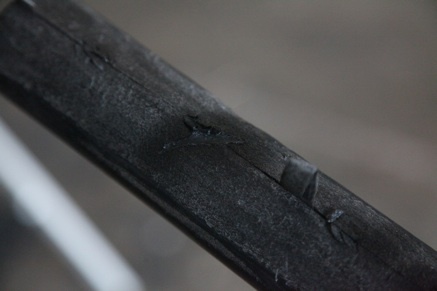 There will be residues in the crack. Do the best you can to get it all out now. Silicones will interfere with the welding. Oh, and you’ll need a plastic welder. I have model 96712 From Harbor Freight. It has it’s own air supply which is convenient. The next thing to do is to stabilize the crack. 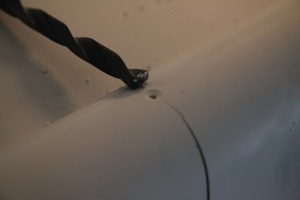 Just drill a small hole at the end of the crack. Next take a larger drill and counter-sink the hole. 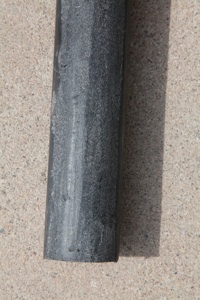 Leave about 1/4 of the thickness of the top. Do this for all cracks, larger & small. You’ll want to remove the weather seal to work on it. 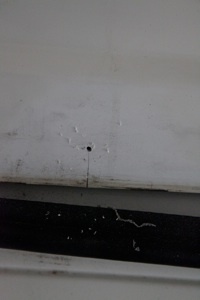 Some of the smaller cracks will be visible only after removing the weather seal ( bulb - for the VW parts department. So, this will feel odd to create more dmage, but the holes will prevent the crack spreading. 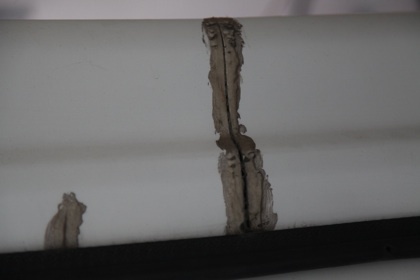 This is standard practice for repairing cracks in the skin of airplanes. Now that you are committed to the task, you’ll want to practice welding. That roof is quite thin. You need to be develop some skill and techniques. It is important to be able to ‘read’ the plastice as you work it. 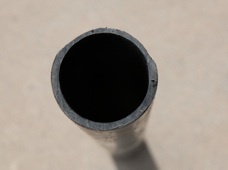 So, go out to your local hardware store and buy some short pieces of black ABS pipe. 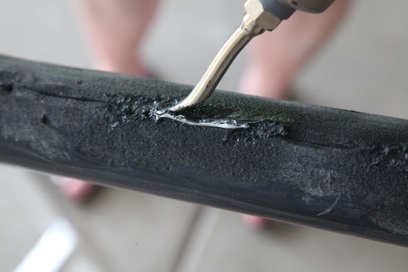 It is inexpensive ( this is why you bought the ABS welding rod ) and readily available. ASA and ABS behave similar, use the same heat settings. 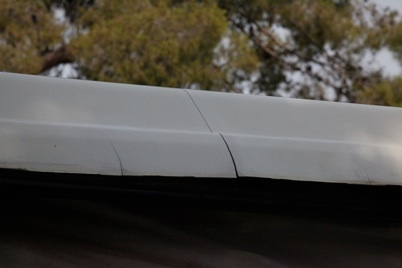 The ABS pipe will be thicker than the roof, so shave or grind one side down to about 1/8 inch, as shown to the left. Then saw a single cut through the wall you just thinned. 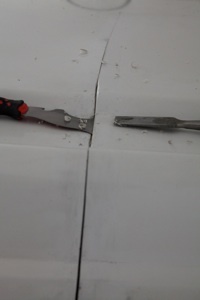 Use a sharp chisel or a cone-shaped burr on a dremmel tool to make a V-groove every couple of inches. I used a chisel and left ‘Feathers’ of the material in place. 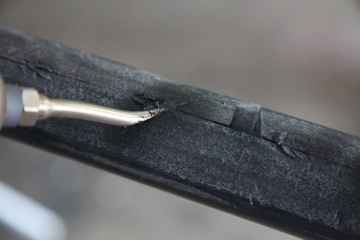 Next, stabilize the crack by spot welding or tacking those places. These plastics turn rubbery and don’t melt nicely like polyethylene, so use the tip like a soldering iron to melt some of the pastic . Draw across the cut. Don’t stay too long in one spot. 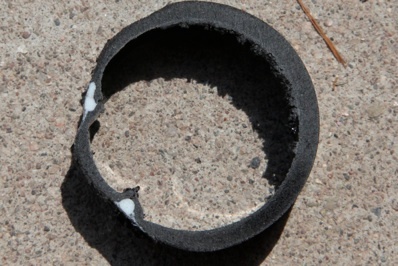 You can’t apply pressure when the surrounding material gets rubbery. The plastic will let you know - so pay attention. Learning to move away before it gets too rubbery will save you hours of work filling in later! Making these tacks helps to stabilize the plastic. Next, you use the chisel and make deep v-grooves between the tacks. You want to expose fresh material and remove any dirt or sealant. 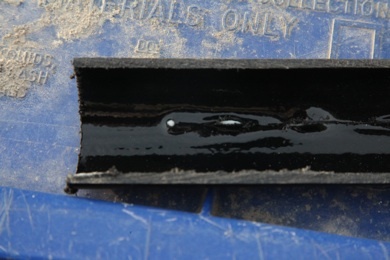 Prepare a few v-grooves so you can move between them as the plastic heats up. Use the heat to warm an area of the plastic. Use circular motion. You will see it get darker as the surface starts to melt. At this point put the welding rod in the v-groove and heat it and the surronding plastic at the same time. 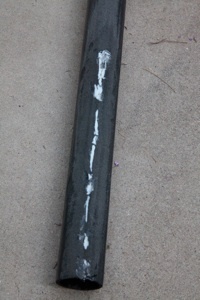 When you can press the welding rod and smear it into the pipe, you are ready to start laying a bead down, as shown to the left. It takes some skill. 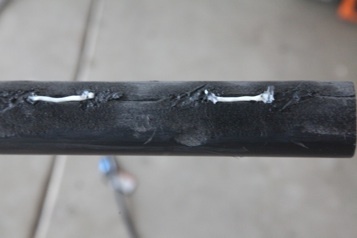 Just get the bead down, If you try to weld this stuff like it is iron, it won’t work. I found that I could cool areas down quickly using a stream of air from a compressor. It saved me hours, becuase it takes a long time for the plastic to cool. Work on small areas about an inch or two long at a time . 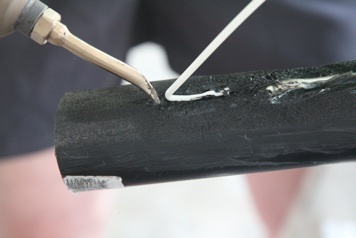 when you have the bead down, Feather the pipe material into the bead and the bead into the pipe. Cool it early - cool it often... Mke mistakes now, as you don’t want to latter when it matters! Cut your work and sand it so you can see how well you did. Try different things. You’ll be ready for the next step When you are able to get good mixing of the pipe and rod without pushing the wall of the pipe down.